Welding automotive structural parts is becoming a bigger concern in the automotive industry, as there are many different types of steel being used to manufacture cars. The techniques we’ve used for years are not going to work for many of the modern day vehicles. What was once mild steel is now being replaced with hid strength steel, ultra high strength steel, boron, aluminum, and composites. The problems with welding some of these types of steels is overheating and destroying the strength of the steels, which could result in a unsafe car. We’ve been discussing how to weld structural parts, such as lower and upper frame rails in class. While teaching the class, I found an excellent video discussing MIG brazing. MIG brazing is one of the solutions and recommendations to welding some of these steels, but only if performed properly. MIG brazing may still overheat and destroy the metal if too much heat is used. In this video, State Farm is interviewing an I-CAR instructor at SEMA 2011. By watching the video, you will learn about the concerns of automotive welding. The car in the video has color coded parts, which will give you a visual of the different steels used to manufacture a vehicle. As you can see from the video, vehicle designs are changing and the repair methods to repair them are changing as well. Proper training, such as I-CAR is a must if you plan on working on today’s car. 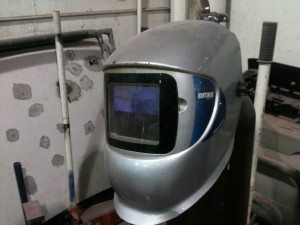 The online training I-Car was referring to can be found at www.CollisionBlast.com/I-CarOnlineTraining I-CAR estimates the training to take about 1 hour and you will receive .25 points after successfully passing the MIG brazing test. Join our newsletter so you will not miss our updates. Simply look at the upper right side of this website and provide your first name and e-mail address.